It’s not unusual for Lisa Russell, the owner of Russell Collection Fine Art on 6th Street in downtown Austin, Texas to receive phone calls asking how much admission is to her commercial art gallery. On the walls of her gallery, patrons have always enjoyed viewing (and purchasing) a rare Picasso painting or an etching of “The Country Dance,” one of Renoir’s most famous paintings. But when the gallery owner doubled her space last year in one of the toughest economic times, she realized that more space meant access to more artists, and she’s slowly been cultivating relationships with some of the country’s most talented contemporary artists. If you’ve not heard of Rimi Yang, Ethan Diehl, Ash Almonte, Brad Ellis, Olga Porter or Nick Patten, this gallery owner is doing her best to make sure you do. Rimi Yang is one of several new artists whose work is on display at Russell Collection Fine Art. but I've always wanted to expand my collection and contemporary artists are doing some amazing work right now – I couldn't pass up the chance to represent these six rising talents. Art is in high demand in Austin, Texas and it’s not just the rare Renoir or Picasso that Lisa Russell’s gallery is known for. Six new contemporary artists have been added to the Russell Collection Fine Art Gallery, named Austin’s most exclusive gallery by the New York Times, and Russell’s eye for the unusual and beautiful has not led her astray. In just one day of receiving six new pieces from artist, Rimi Yang, one is marked with the red dot (meaning the piece has sold) and the others have received interest from potential buyers. Los Angeles based Rimi Yang was born and raised in Osaka, Japan and is known for her intense enthusiasm for vibrant color. Celebrating the chaotic emotional duality that exists in life in her art, she revels in the confusion mankind creates in its attempt to order the un-orderable and to explain the unexplainable. She mixes different techniques from various painting styles, escorting viewers down the path to her unique and mysterious wonderland. Ethan Diehl lives, works and paints in Austin, Texas, where he uses photographs, computers and grid systems to create eye-catching masterpieces. Painting in one eighth-inch squares in various shades of gray, this color blind artist produces the unreal realism of emotionally and visually complex images. Ash Almonte is just 26 years old and lives in Abilene, Texas. She uses symbols to tell her story and in her work expresses her own personal passions, energy, thoughts, ideas and stories about overcoming odds throughout her life. A recent series of self-portraits use fruits and vegetables, which symbolize a past struggle to make ends meet for her family by selling these items on the side of the road. She considers her work food for the soul, infused with love. Brad Ellis creates canvases with encaustic and his studio in Dallas, Texas is home to this labor-intensive process that often takes weeks and months to create a single piece. Encaustic paint is heated to a liquid state and after application to the surface, is fused with a heat source for bonding. Combining this technique with oil paint and collages result in textured surfaces that keep the eye venturing over wisps of colors and seemingly random patterns. 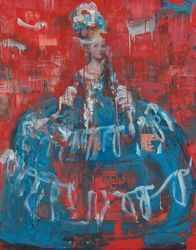 Houston based Olga Porter is a Russian born painter. She is inspired by living, moving scenes and takes frequent painting trips across the U.S. and abroad. The subjects of Porter’s paintings are cityscapes and the human form. Her work is distinguished by forceful gestural marks, light abstraction, occasional displacement of elements and play with proportion. Nick Patten lives in the Hudson Valley of New York and explores light and shadows via oil paintings. His current interests focus on room interiors and draw the viewer in to these private spaces that beckon curiosity and contemplation. The Russell Collection Fine Art Gallery is located at 1137 West 6th Street in Austin, Texas. Gallery hours are Tuesday- Saturday from 10 a.m. – 6 p.m. More information can be found on the gallery website or on Facebook. Photography and interviews available upon request.